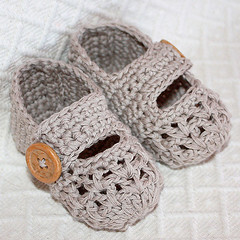 I have a number of friends expecting babies this winter and spring, which seems like a perfect reason to dive back into some crochet projects. Conveniently, baby projects also tend to be small, and small/quick projects will be the key to me finishing anything this autumn and winter! I have a Webs gift card (courtesy of Meg and Steve) burning a hole in my pocket- this might be the perfect excuse to buy a new crochet book. My Little one would love those! haha! !